Our creative staff is at your fingertips, to assist putting the finishing touches on your project or to create something fresh from start-to-finish. With years of experience producing an endless variety of graphic design projects we’re up to any design challenge. 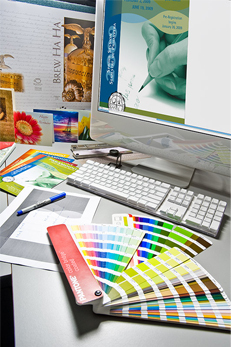 If you have a stack of photos and no brochure layout, we can complete the job. If your designer quit mid-catalog to move to Tahiti we can pick up where she left off. Or perhaps your logo or stationery needs a modern touch. Let us help facilitate your next big idea.